Results: Teacher (LET) September 2017 Board Exam (List of Passers, Topnotchers, Performance of Schools) - Balita Boss! 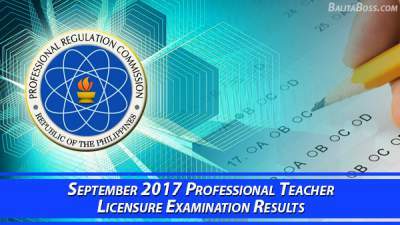 The Professional Regulation Commission (PRC) released the official results of September 2017 Licensure Examination for Teachers (LET) on Monday, November 27, 2017. The examination was conducted by the PRC on September 24, 2017 in 27 testing centers all over the Philippines, Hong Kong and Thailand. A total of 21,198 elementary teachers out of 80,509 examinees (26.33%) and 49,626 secondary teachers out of 107,020 examinees (46.37%) passed the September 2017 Teacher Licensure Examination, according to PRC (via PRC Website). MARY CLARENCE GEPES MADERO, a graduate from WEST VISAYAS STATE UNIVERSITY-LA PAZ, ranked first in the Elementary Level September 2017 Teacher Licensure Examination with a rating of 88.80 percent. RHOY AUTENTICO OMEGA, a graduate from UNIVERSITY OF MINDANAO-DAVAO CITY ranked first in the Secondary Level September 2017 Teacher Licensure Examination with a rating of 93.80 percent. To download the September 2017 Elementary Teacher Topnotchers, click here or here. To download the September 2017 Secondary Teacher Topnotchers, click here or here. To download the September 2017 Elementary Teacher Licensure Exam List of Passers, please click here or here. To download the September 2017 Secondary Teacher Licensure Exam List of Passers, please click here or here. To download the September 2017 LET (Elementary and Secondary Levels) Performance of Schools, please click here or here. With 50 or more examinees and with at least 80% passing percentage, UNIVERSITY OF SANTO TOMAS emerged as the top performing school in the September 2017 Elementary Teacher Board Exam as per Commission Resolution No. 2010-547 series of 2010, with 93.81% passing percentage or 106 out of 113 examinees passed the exam. With 50 or more examinees and with at least 80% passing percentage, UNIVERSITY OF THE PHILIPPINES-LOS BAÑOS emerged as the top performing school in the September 2017 Secondary Teacher Board Exam as per Commission Resolution No. 2010-547 series of 2010, with 98.33% passing percentage or 59 out of 60 examinees passed the exam. Elementary Teacher board exam covered the following subjects: General Education (40%) and Professional Education (60%). Secondary Teacher board exam covered the following subjects: General Education (20%), Professional Education (40%) and Specialization (40%). The Board for Professional Teachers who administered the Teacher Board Exam are Dr. Rosita L. Navarro, Chairman; Dr. Paz I. Lucido, Vice Chairman; Dr. Paraluman R. Giron and Dr. Nora M. Uy, Members. The date and venue for the mass oathtaking of the successful examinees in the September 2017 Teacher Licensure Examination WILL BE ANNOUNCED LATER, PRC said. During the last examination conducted last March 2017, a total of 5,600 elementary teachers out of 53,915 examinees (10.39%) and 18,482 secondary teachers out of 72,584 examinees (25.46%) passed the Teacher (LET) board exam, PRC announced. SAMANTHA CHRISTEL CHUA GAERLAN topped the March 2017 Elementary Teacher Board Exam with a rating of 90.60%. MARIAN KAYE FORTINEZ GALLEGO topped the March 2017 Secondary Teacher Board Exam with a rating of 92.80%.